Marvel super villain Stryfe, leader of the Mutant Liberation Front and sworn enemy of team X-Force, first appeared in 1990 in issue #85 of X-Men spin-off comic The New Mutants. In the final issue #100 readers were in for a huge surprise when he removed his helmet and revealed himself to be none other than his own enemy the mutant Cable! Confused yet?! Stryfe is the mysterious evil mutant who could be Cable's brother - or perhaps even Cable himself! No one knows the truth about this fearsome warrior, and anyone who came close to finding out learned never to do it again! 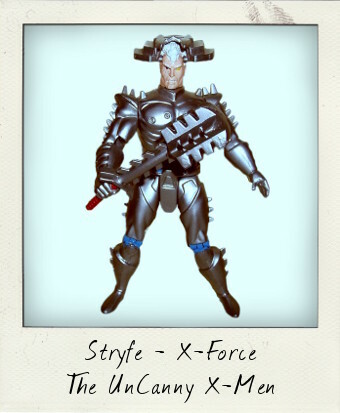 Stryfe was actually a clone of Cable, and both characters would reappear alongside the other New Mutants in their own relaunched series X-Force in 1991. 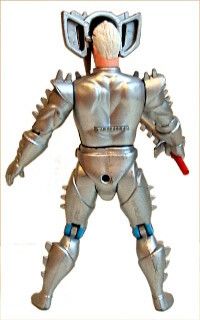 In fact, by 1992 X-Men franchise holders Toy Biz had also launched an action figure sub-series called The Uncanny X-Men – X-Force including this 5 ½ inch Stryfe figure. Stryfe's armor is not only shatter-proof, it's packed with amazing weapons systems. But his most dangerous weapon is his energy mace - with just a touch it can destroy a skyscraper. Stryfe - all is revealed! Given the hype on the back of the package it's clear that Toy Biz certainly knew how to raise kids' expectations with this figure! To be fair they did a pretty good job with the armour – it looks nicely metallic, and the spikes make him appear pretty fearsome, with the touches of blue, and the red plastic cape (missing on my figure) making him a good match for the comic book. As with so many of the Toy Biz X-Men action figures he features a special “twist-waist action”- the back of the figure has a place to rest your index finger or thumb to help you swivel him from side to side, so he can brandish that dangerous energy mace of his. His right hand is molded ready for the mace to slide into his fist, and the ridged handle of the mace ensures that it stays a tight fight, meaning that even twenty years after it was made this loose figure is still holding on tightly to his weapon accessory. Whilst there are plenty of points of articulation with a surprising eleven points in total - at the helmet, neck, shoulders, elbows, waist, hips and knees too - he's actually rather tricky to pose and hard to balance with the mace in place. The coolest point of articulation, however, has to be the “Flip-Up Helmet Reveals Identity” action feature, which re-enacts the grand finale revelation of The New Mutants. A must have vintage action figure for any X-Men collection! I just picked up a couple more Toy Biz figures over the weekend!I’m totally digging your Toy Biz Toy Biz posts! great post- loved reading that 90’s X-Force stuff for the first time here recently. love those old ToyBiz figures! awesome villain. Wonder if it would be necessary to make a separate “Cable” toy.